Hey guys. Do you love to win Gift Cards as much as I do? Well then I have some really great information for you. There is going to be a Gift Card Weekend on Facebook. And during the weekend of December 23 through December 31, you will have a chance to win a $10 Subway Gift Card. All you have to do to win is go here: to like the page on Facebook. After you like Gift Card Weekend on Facebook, be sure to share with your friends. Because you will get another entry for every like that you influence. So get on over to Gift Card Weekend. It is a once a year event. And participating retail partners will give featured offers on Gift Cards purchased during the holiday season. So if you are a gift-giver you can benefit from this too. You can increase the value of your gift card! Head on over to the Gift Card Weekend Facebook page for all the info! I know I will be! Friday we are going back to my Mom's to visit for a week. I haven't seen anyone in 6 months. This photo was taken in July at a cookout - the last time I saw anyone. I am kinda depressed though since my sister pictured standing on the far left has been diagnosed with a brain tumor. I will (try to) treasure every moment I'm home. I remember a few years ago - I went to a PartyLite party. Another mother in my neighborhood had one and invited me to it. It was a lot of fun. Afterwards I really wanted to host a party of my own. But for some reason I never got around to it. Now I am reconsidering it! It would be fun to get some new candles and all the other accessories you can get! Just hosting a party you could get so many rewards. I can't remember - but I know the woman who hosted the one I went to got so much stuff afterwards for free doing it! It really was worth it. And I remember some games we played and it was a lot of fun getting together with people. It might be fun doing one here in my new neighborhood. Maybe a good way to meet some new people! I am supposed to tell you about the PartyLite Simple Pleasures Holiday Sweepstakes. But unfortunately this ended on December 15th. But don't despair the new PartyLite Winter/Spring Catalog already launced on December 16th. So check that out! And you should really "Like" PartyLite Facebook page - because you can find out about special monthly offers online for party hosts and guests. I would love some of these candles pictured here. Doesn't this look so festive? Hey everyone, I have some exciting news for you! And it is about Slim-Fast. They have launched their best plan in years. This is a really exciting launch for the brand. Slim-Fast is introducing their richest, creamiest, best tasting shakes ever! The new plan is called Slim-Fast 3-2-1 Plan. It includes 3 snacks a day, which the Slim Fast 100 calorie bars look great. 2 Slim Fast shakes a day, which they look really delicious. And 1 balanced meal a day. You can enjoy a healthy 500 calorie meal on this plan. All the Slim-Fast products are readily available to everyone. You can find them at your local grocery store. You can also find them at retailers such as Walmart, Target, Kroger, and Safeway. You can also buy Slim-Fast online through Amazon.com or on Slim-Fast 3-2-1 store on Facebook. This plan sounds really great. And I may incorporate this into my health plan. Which at the beginning of the year I always have that in mind. I really am most excited to try the new Slim-Fast shakes. I remember way back when - my college roommate and I tried Slim-fast and we really liked it! I really want to try some of these new flavors. Like Creamy Milk Chocolate, or Cappuccino Delight. And there are more too. Sounds like a great plan. Don't you think? I need new phone! I was just looking into the LG DoublePlay™ and I would really love to get one. This phone looks so awesome. Check it out for yourself to see all the features. I will try to relay some of them for you now. First of all it has a great looking screen display. The LG DoublePlay has main display and a sub display that can be used separately or in tandem. It also has a slide out keyboard. One of my friends has this, and it looked awesome. Great for easy text messaging or even updating your Facebook status. Their also is a 5-megapixel camera and a video camera too. This is also great for all your social media needs. There is also Cloud Text, Group Text and a lot of shortcuts. And more! I am not 100% phone savvy yet - but with this phone I think I could definitely learn! I know who else in my family would love this phone too - my daughter. She has been bugging me to get her one. She wants to text her friends now. She has been using one to send about 10 or more texts a day. And she could Social Network on the phone too. How many texts do you send in a month? And how many hrs. do you spend Social Networking on your phone? Let me know in the comments. Maybe we could all get an LG DoublePlay! I also want to let you know this phone is exclusively from T-Mobile. So check it out today! I have a great opportunity for you guys. You can now get some great deals on Android™ powered EVO 4G devices. This is fantastic news, just in time for the holidays. Do you think this sounds like an awesome deal? Well if you do then you should hurry up and go check it out. That is because this is for a limited time! Go to the website now and you can get the EVO or EVO Shift free. Plus you will get free activation on new lines of service! Isn't that cool? Please do as quickly as possible though. They have a countdown on the website and when I just checked there was only 55 hrs left for this deal (will be less after I post this obviously). So this is going very quickly. Anyone want one for the holidays? Anyone you know? Or maybe you would even like one for yourself. I would love one of these. I may have my husband look at this later and maybe have him get me one! Ha-ha! I also want to let you know that not only will the activation be waived for new lines. But it will also be free shipping too! So you really can't beat this deal! Go now! This is a Sponsored post written by me on behalf of GravyMaster for SocialSpark. All opinions are 100% mine. Hey guys. I've got some great info. I want to share with you all! It is about a cool product I learned about. It's called GravyMaster. Maybe you are already familiar with it? I wasn't so I found out some details about it though that I thought were interesting. I'm sure you are thinking that GravyMaster must be to make gravy, well that is true. But GravyMaster is not just for gravy. GravyMaster can help you to Master the meal. Especially during the Holiday season it could really come in handy. Some of the other uses for it are, caramelizing veggies or other foods. And it also helps to lock in flavors and juices. It has ingredients that can really help your holiday recipes. Try it out this holiday season! Some ideas are that it can lock in flavors for your grilled meats or veggies. It also is great on fish. Caramelizing foods is another use. And it can be used in sauces or reducing sauces. With all these uses Gravy Master is actually not just for the holidays - it's for everyday! I would love to make some Chicken Teriyaki using Gravy Master. Sounds yummy. What would you like to make with GravyMaster? I'm really loving the "county" I moved too. Really has a small home town feeling. My daughter has been getting involved and seems to really love it too. This past Saturday she was in a Holiday Parade - with her dance school - she got to dance in the parade and really had a great time. Here is her original x-ray the day it happened. I see something right there on elbow - where I placed arrow. But the orthopedic guy said he is having a hard time seeing anything? But in the meantime she still has two weeks to wear the cast. Better safe then sorry. - Hey maybe I should be a DR. - lol. I received a really cute product, I want to share with you guys. It's official! 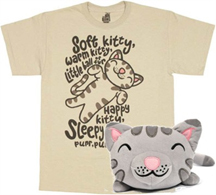 Stylin Online, the largest online pop culture apparel retailer, has released the much anticipated “Soft Kitty” singing plush toy and t-shirt combo from CBS' ratings-busting The Big Bang Theory (items also sold separately). In one unforgettable TV moment, Sheldon teaches Penny lyrics to a song his mom sang him when he was sick. The infectious song instantly became viral sensation and fan favorite! form-fitting style, is available separately or together with a brand new Soft Kitty plush - one that sings the ever-popular "soft kitty song" featured in the classic episode. Just press the paw and Soft Kitty will sweetly sing the tune - “Soft kitty, warm kitty, little ball of fur. Happy kitty, sleepy kitty, purr, purr, purr” - just like on the show. Fully 10-inches long, this grey and pink plushie is the perfect size to snuggle with. You will be hard pressed to find a cuter plush toy or more in demand pop culture collectable combo this season! I don't know if you guys are fans of 'The Big Bang Theory,' but I will watch this show sometimes. I really get a kick out of this show. It is so funny. 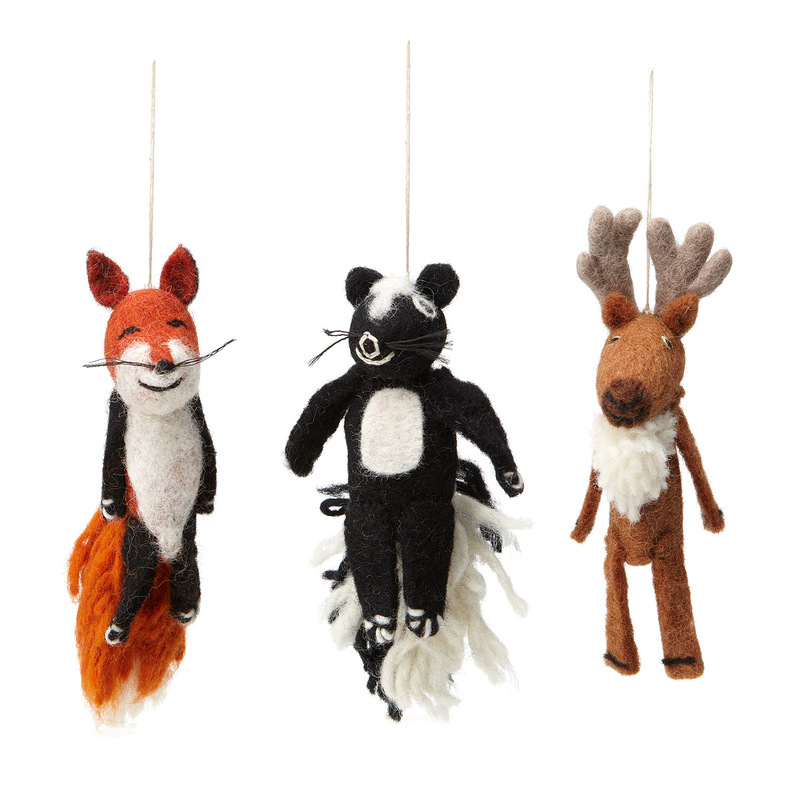 Check these out - they'd make nice holiday gifts! Disclosure: I received one or more of the products mentioned above for free from sponsor. Regardless, I only recommend products or services I use personally and believe will be good for my readers. Do you guys feel that internet security is important? Do you remember a time when you really wish that you had a better anti-virus software? Well if you are a small business owner then you may know the importance of Internet security. I would like to tell you about an important product for you then. It is called Norton Small Business by Symantec. Recently there was a survey that found out what is important to small business owners. And it identified that 1 in 3 respondents claimed that internet security was of high importance to them. It also was found that over half of small business owners have stated that they had experienced some malware on their computers in the past 3 years. And 51 percent of them said they they had to pay an expert to help resolve the malicious software on their computers. I also want to let you know right now there is a 30% discount for small business owners who purchase Norton Products. And you should also check out some new products - 2012 Norton Small Business products now available for 30% off - These actually launched in September - Norton 360 & Norton Internet Security 2012. I really believe in the importance of anti-virus software. And could of used it a few years ago. My computer got a virus and there was no fixing it. If I just had better security I really could have saved myself a lot of money. What about you? And which Norton product would you like to purchase? Let me know in the comments! *she needed to get the other cast taken off - because they wanted to get another x-ray, so she picked this blue one. - December 14th she will get this off & then she should be good to go! Do you wear glasses? Well if you do, I would like to tell you about a great website to purchase some cheap eyeglasses on. It is called Zenni Optical. If you need some eyeglasses then I would really recommend checking out this website. It is so cool that you can save some money on your glasses. Zenni Optical can give you low cost eyewear, because they have no middle man. And they also have no retail overhead and practically no advertising budget. I think these would be really cool on him! Give him some extra pizzazz! And the price is great! What do you think? Do you like these? I know he likes this shape on the lenses. And these are a little different so I think these would look really nice on him. So go check out Zenni Optical because you really can not beat their prices. And in this economy it is important to save money anyway you can. I know I could! Especially with the holidays coming up, I need to save money for that! Hey guys! I've got a cool review/giveaway for you. These are some great Stocking Stuffers that I want to share with you. Please click here for more info on this. I received 3 stocking stuffers. 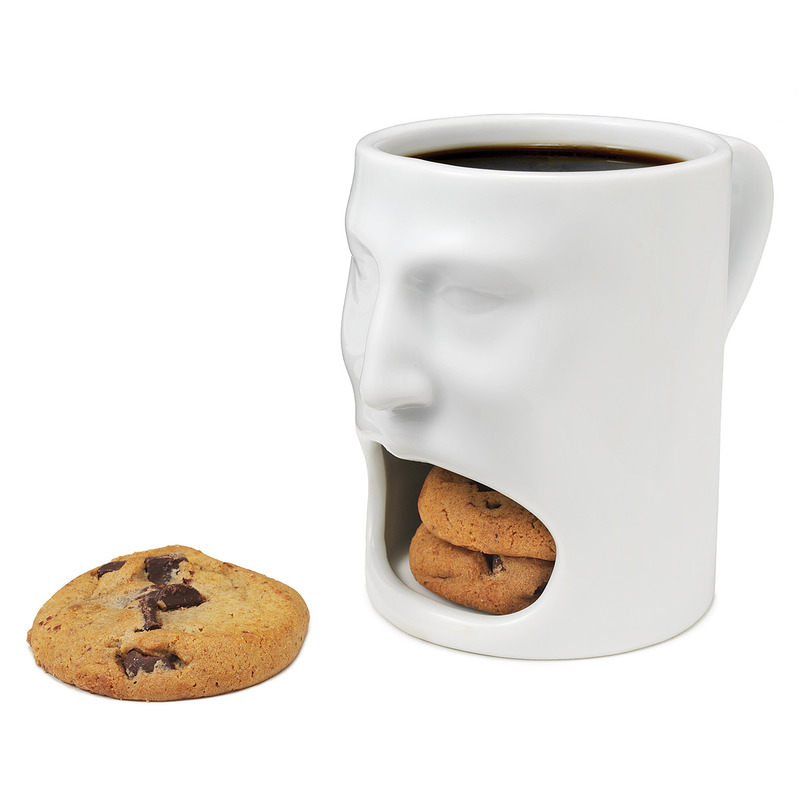 They include a really cool Face Mug. I am not kidding when I say my daughter & husband love this mug! They want to get more to giveaway to people for the Holidays. Also is a "Corkcicle." 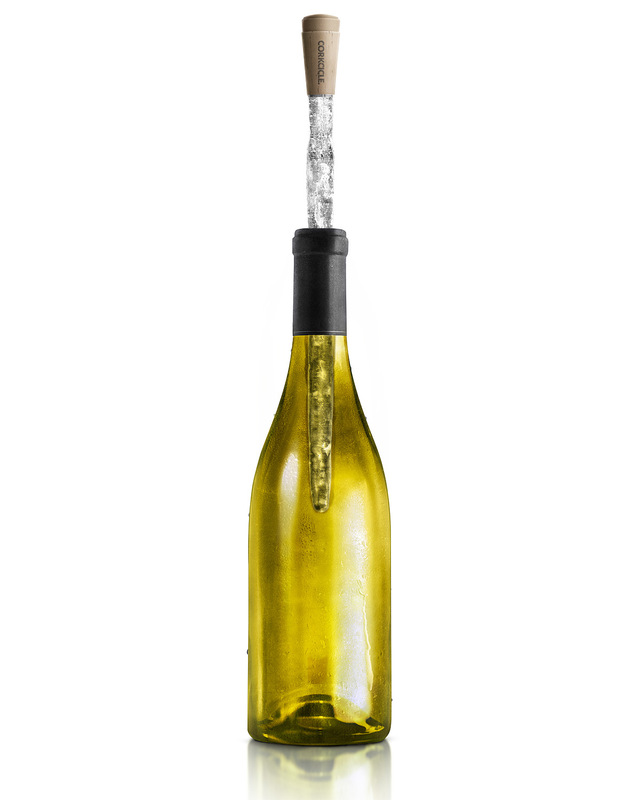 You can put this in your bottle of wine to chill it. I'll try it out this weekend! I also got a really cute finger puppet. Which can also be used as an ornament. I received the "fox." He is so cute! Don't you want to win these Top Gifts (shown above) too? Also visit Uncommon Goods website for more Top Gifts. Well now you can. Enter below to win these three (3) Cool Stocking Stuffers. To get more cool stocking stuffer ideas please go here. This is a Sponsored post written by me on behalf of Hiltons of Branson for SocialSpark. All opinions are 100% mine. This Fall is a perfect time to take a getaway to Branson, Missouri. And while you are there you could stay at the Hilton Promenade at Branson Landing or at the Hilton Branson Convention Center Hotel. Next time I go to Branson - I would really love to visit all the great attractions they have to offer there. Let me just share some of these so you can get an idea. There is a place called Silver Dollar City. This attraction is an 1880's themed experience. Check it out for yourself on the website, but the are having so many Holiday things going on - I want to go there! Another attraction I will visit is The Titanic Museum! Wouldn't you want to visit there? It sounds really cool. This is a very neat Museum that really lets you experience what it was like to be on the Titanic, walk the hallways, etc. And they are having a lot of holiday festivities there too. Check it out! I also want to tell you about the Level 2 Steakhouse. This restaurant is located within Hilton Branson Convention Center Hotel. And they are also having an awesome Thanksgiving Brunch and a "Turkey to Go." In which you will be able to get everything on an awesome menu, for Thanksgiving. The brunch is $38 per person. So go check out all the great deals & attractions going on in Branson right now. And of course like I do - I'm sure you will want to stay at the two hotels: Hilton Promenade at Branson Landing & Hilton Branson Convention Center Hotel! Last week I posted about my daughter - the beautiful ballerina. Now unfortunately I have to post about my beautiful daughter in a cast. She broke her arm on Saturday! It was a nightmare, and I don't even want to get into details - but it basically was caused by something I reviewed on here. Hint: Check my archives for August. This is a Sponsored post written by me on behalf of DollarGeneral for SocialSpark. All opinions are 100% mine. Veteran's day is coming up, and I feel it is so important to honor our service men and women. Don't you? They have done so much for our country, and it is great if we can support them in anyway we can. I also just found out that Dollar General is supporting Veterans. On November 11 (Saturday) there will be a Dollar General's Veteran's Day discount. Dollar General is having a 10% discount. It is for Active Military and there families in the store on Saturday. There is no coupon needed. Also there is more to this! In addition to the great deal I mentioned above,check this out! From November 11 to November 13 they will be an online discount available to everyone! To get a 10% discount online just use the code 'VETERANSDAY' at checkout. There is also another great way to support the troops. You can send a care package to the troop of your choice. There is $20 or $30 option to send to service men & women. They are sending items such as toothbrushes, shampoo, etc. Dollar General is offering to send these care packages with free shipping! Go to their Facebook page to see some videos. These are support/thank you videos for the troops. You can also record and upload a video with a brief message & Dollar general will be featuring them on their Facebook page. Cool! Thanks Dollar General! For 3 years my daughter took "Hip-Hop" classes. Now that we moved and she is going to a different dance school - she decided to try ballet. She is really enjoying it. And this dance place seems to do some more fun things then the other one. Like next month they get to march in the Holiday Parade & the recital is based on a musical. They are doing "Mary Poppins." So that should be cool. Hey - I just wanted to tell you about a really cool blog I discovered a couple of days ago. It's called Blog Hops Everyday. I had gotten away from doing Blog Hops, I used to do them more on Fridays. But I found this blog that lists all kinds of blog hops for everyday of the week. I joined some for the past couple of days, and have gotten some new followers. Go check it all out! This is a Sponsored post written by me on behalf of PackIt for SocialSpark. All opinions are 100% mine. Hey guys, I wanted tell you all about a cool product I found some information on. It is called PackIt lunch boxes. I don't know if you have heard of them or not, but I am fairly new to this product. This is a great invention. It was created by moms! Jeannette and Melissa created PackIt. They figured there had to be a better way to keep the kids lunches cool. And they came up with PackIt. This lunch box/cooler will stay longer then almost any other lunch box out there. Unlike gel packs that may only last about 2 hrs. The PackIt will last up to 10 hrs! That is awesome - I think anyway. Don't you? I could really used one of these! I would use it for my kids lunches. My kids buy their lunch at school on some of the days. But a couple of times a week, they don't like what is going to be the lunch that day in school. So they want to bring it in. And I worry sometimes that they are not staying cold enough. Especially if they bring in cold cuts, you want them along with drinks too - to stay cold. Also go now to the website to order and for $19.95 you can buy one PackIt and get one free! What would you use your PackIt for? Let me know!